Modern shape and style from this sofa will give your living room the special look you've been searching for. Three seat cushions provide ample space to unwind and loose pillows allow you to get the support and comfort you need. Track arms and chrome finished metal legs provide this piece with its contemporary appeal. The Savino Contemporary Sofa with Metal Legs by American Leather at AHFA in the area. Product availability may vary. Contact us for the most current availability on this product. Add modern style to your living room with the Savino upholstery collection. Track arms and metal legs promote a sleek design in each piece, while down-filled back and seat cushions offer exceptional comfort. Double-needle top stitching, as well as the contrasting chrome of the legs, give a quality look to the collection. The advanced suspension system used in each piece will support you and leave you feeling more relaxed. Available in many leather, fabric, or Ultrasuede­­­® covers. 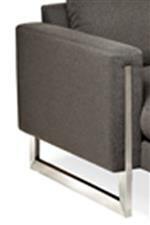 The Savino collection is a great option if you are looking for Contemporary furniture in the area. Browse other items in the Savino collection from AHFA in the area.